Letters & Journals Magazine is looking for a thousand interested souls to join as charter members. I just subscribed, hope you will too. This has to be one of the coolest paper weights ever. The University of Oxford Writing and Style Guide has advised writers to avoid using the serial/Oxford comma. I may need to lie down. Not a great picture of her but she rarely stops moving right now. When she does I 'll have lots more to show off. She's 11 months old, an Abyssinian/mix (there's a white dot of fur on her chest and her tail has very pale black rings on it). I call her Squeaky as she is so talkative, especially at 5:30 am when she wants her can of cat food now. She doesn't seem to understand the concept of dry food, which will be difficult when I go away for a few days at Christmas. We'll see how that works out. She's much smaller than the other two, and I doubt she'll be any bigger even though she has enormous presence. The other two cats weren't that happy when I brought her home, but it only took 24 hours for them to come around and love her. Must be a new record. 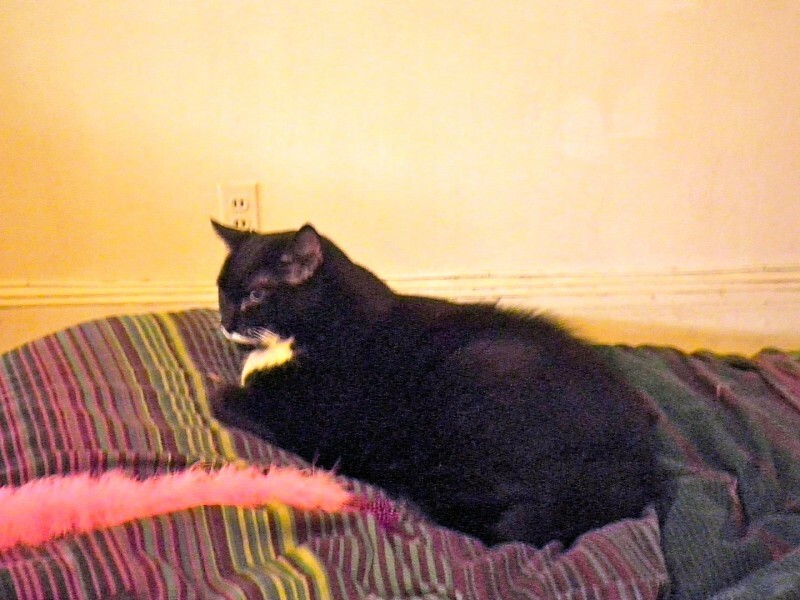 Mally is now top cat, and sets the tone for the apartment. Seranne would actually be first in line based on age, but she's more a follower than a leader (and a bit too spacey to even realize there's a hierarchy at all). 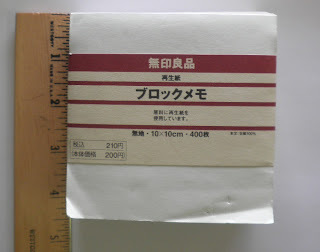 Just a small item I picked up on one of my trips to Muji, but hadn't had a chance to use it until now. I like to use scratch pads instead of yellow stickies for quick notes, as I feel like I'm wasting a perfectly good 3M for a calculation or phone number. But with a scratch pad, especially one made from recycled paper, I don't feel quite as guilty. Muji's pad is a 4x4 square made from 50% recycled paper with the feel of a slightly heavier newsprint. It's a dull cream color, which you don't really see too well in the picture (only one of which would load for some reason, grrrrrrr!!!!). The square size fits perfectly on my desk or in one of the compartments in my handbag or carry case, so it's portable as well and could actually be divided into smaller amounts (there are 400 sheets, enough for 4 to 8 pads if you're so minded). The paper itself is quite nice, a bit thicker than regular newsprint but nowhere near the Rhodia/Quo Vadis 80gsm to 90gsm weight. I forget the price, but less than $2 definitely, which makes it a great stocking stuffer for the paper and office supply lovers on your various lists (birthday, holiday, I'm sorry day, etc.). Writing is fine, the paper is thick enough so there is no bleed through but a definite shadow using a gel ink pen. Pencils work well too, although you have to be careful of smearing the graphite. All in all this is a cute scratch pad that looks much nicer than the regular bright white rectangles you see on everyone's desks. If you're near Muji sometime (or online, although these are just slightly larger), check out these cute pads. 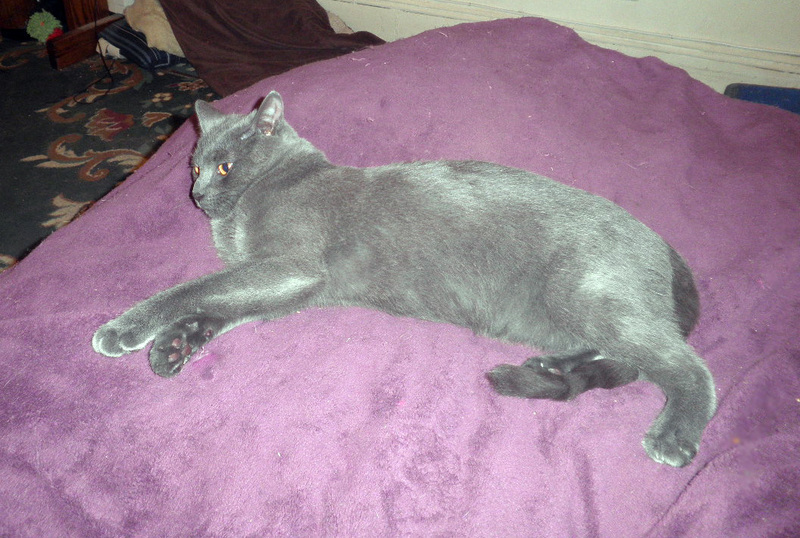 Unfortunately my big boy's heart wasn't able to do the job, and he became very debilitated very fast. He crossed over Sunday morning at 10:53 am with my arms around him. Posting will resume next week, when I get my own heart glued back together. I am waiting on the notecards I just ordered from Snapfish of Gift featuring Mia's wonderful watercolor. They should look fantastic. Playing around with some of my more interesting inks, I thought I'd catalog the blue-green shades and see where they fit on the spectrum. The greenest of the blue-greens is Noodler's Squeteague. In swabs it may look more blue, but this is actually a deep pine green with an undertone of blue. Next is Iroshizuku's Syo-Ro, which is describes as a dark turquoise. It's blue with just a hint of green to it, and I have to say I was impressed by the color and wondering why I don't use it more. 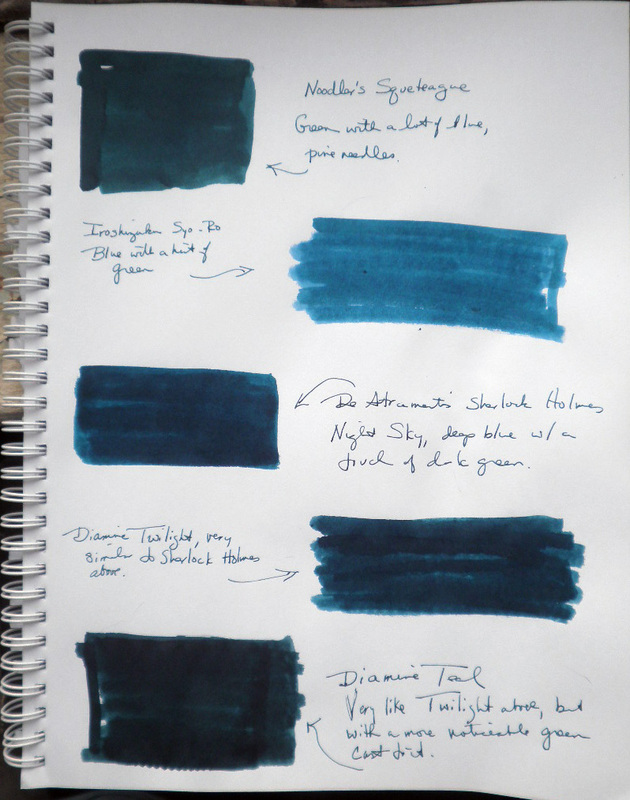 The two that are most similar are De Atramentis Sherlock Holmes and Diamine Twilight, dark night sky blues with a touch of green to deepen the hue. Finally, there is Diamine Teal. Teal looks as if it is more a 50-50 blend of blue-green than any of the others and perhaps the standard for that mix of color. This is the beautiful watercolor Mia created for me from one of my favorite pictures of the big boy, Bast's Gift. I have a few favorite pics of him stretched out on one of his favorite chairs, and now I have the perfect watercolor portrait for my office. Amazing what you can do with water, pigment, and paper (as well as tons of talent such as Mia's). During the recent conference downtown, I had a chance to get away to the Fountain Pen Hospital to check out some of their wares. One pen I saw online was Conklin's Herringbone series, based on Conklin's 1923 Duragraph pen. This new pen features a herringbone pattern engraved underneath a clear colored acrylic wrap that allows the pattern to show through. On the website this pen looks like a subdued light pink. In person it practically glowed! It is one large pen, with a large nib and clip. I like the styling on this, the way Conklin has placed its name everywhere it can: the crown of the cap, the clip, and especially the nib where it's in a gold-plated oval surrounded by silvery iridium. The band around cap features the Conklin "C" and half-moon crescents. 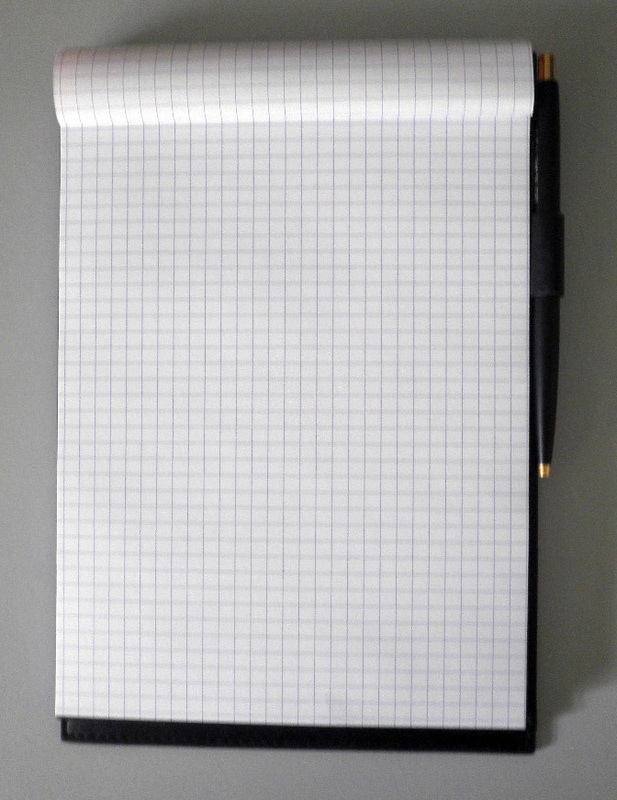 Above is the pen next to a TWSBI fountain pen with a fine nib, as a comparison of the two sizes. 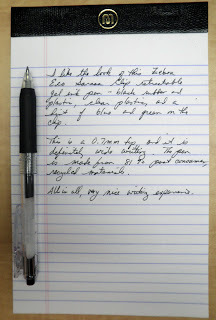 While the capped TWSBI is slightly longer than the Conklin, the latter is a much bigger pen. The bright, deep pink is only one of several colors for the Herringbone model, the other that I was interested in is a bright teal. If you're interested in a large, colorful, noticeable fountain pen than the Conklin Herringbone is for you. My three furballs would likely be pleased. The Pilot Knight, introduced around 2005, is a medium-priced fountain pen and rollerball collection with some very interesting styling details. The pen has a thinner section than most fountain pens, with a beautifully tapered body. The matte finish is elegant, with silver accents on the ring and clip (which has a snap up mechanism similar to the Sarasa Clip). In fact, the clip isn't as heavy as it looks given that it's solid stainless steel, and the pen doesn't feel too weighted down when posted. The pen itself is 5 3/18th inches when posted, and 5 3/4 inches capped. All of the Knight fountain pens are medium stainless steel nibs, stamped "Pilot Super Nib Japan." This is one of the nicest nibs I've ever used, it flows smoothly with no dry starts or skipping. It's also an aerometric filler, something you don't see very often outside Chinese Hero fountain pens or similar brands. The filler worked very well, better in fact than some of my other converters. All told, this is a very nice fountain pen. As Pilot has discontinued the Knight, many pen stores have put it on sale for a lot less than the $45 to $48 suggested retail price. If you're looking to add to your collection, take a look at the Pilot Knight. 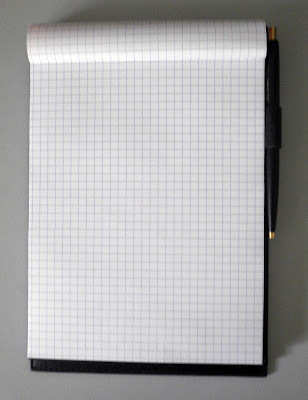 My favorite Rhodia pad is the N°16, which at 6 x 8.25 (A5) is just the right size for most of my note taking needs. I was very pleased when Rhodia introduced Pad Holders for the larger sizes, and especially so when I saw that the N°16 is the only Holder with a convenient side pen loop. 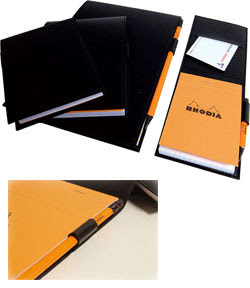 The Holder is imitation black leather with the Rhodia logo embossed on the front cover. Flip the top over and you have enough backing support for writing, which is great if you're taking notes somewhere other than your desk. The inside front cover also has a pocket for papers, receipts, cards, and whatever loose stuff you need to carry at that time. If there's any drawback to the Pad Holder it's that you cannot write on the other side of the Rhodia sheet, which is one way to handle the ink bleed-through problem. If you are at all bothered by "wasted" space (one-sided writing only) then this is not for you. Otherwise, consider investing in a Pad Holder for your favorite Rhodia, either black or orange--it's a classy way to write. I'm still recovering from the 'flu, then will be at a three-day conference taking place a few minutes walk from the Fountain Pen Hospital (willpower is not us, right now). So this week may be a round up of cute kitten pictures and favorite You Tube videos, as well as a few pick-me-ups from FPH. I cannot believe 174 million people have watched this video. It's a favorite of mine, enjoy. While I'm not a pencil person, there was no way I could pass up this set. Made in the second quarter of 1940 (it's marked ".0." on the side of the barrel), this Blue Pearl is one of the nicest Parker fountain pens I've seen. The plunger is in good working condition, the nib is excellent, there's no brassing--possibly the only thing that needs replacing is the pencil's eraser, which is old and crumbly and unusable. The pen itself has a fine nib, which I like, and has some flex to it. I'm not quite sure if the nib is original to the pen, although I'd be inclined to say it is. All together, this is one of my favorite pens and it gets a lot of use. For obvious reasons! Note Booker, Esq is hosting the June Carnival of Pen, Pencil and Paper, and he's pulled together a lot of great posts to enjoy. Stop by and browse the great posts. The De Atramentis Historical Figures line has some great ink colors and interesting combinations (Sherlock Holmes is a night sky color and is actually very similar to Diamine's Twilight). One that I've really come to like is Raphael. a deep indigo blue that's just a touch darker than lapis. I don't know if the great Renaissance painter Raphael has any particular affinity to this deep blue color, although he would have used this or something like it for the robes of Mary and Jesus. But I don't see any of his works that shout "Raphael Blue" for a particular color, unlike Botticelli's beautiful red-gold that he used in The Birth of Venus. I've compared the De Atramentis Raphael to a few other blues, including Sherlock, Sheaffer Skrip Blue, and Sailor Gentle Ink blue black. Very different colors, with the Sheaffer Skrip being the only "common" ink of the group that doesn't take much effort to purchase. The Raphael ink stands out for the beauty and clarity of its color--it's not bright or a stand out, more subtle and quiet. You really aren't aware of the color until later, when you read over your writing and notice what a nice shade of blue this is. The ink does shade a bit with my Moore flex nib, but I'd expect that to happen with any vintage flexible nib. Whether I can get the same effect in a Lamy or Pelikan remains to be seen, but even with fine Japanese nibs the deep indigo color is noticeable. Drying time is average, and it is not waterproof. Definitely one of the loveliest blues in my collection. Did you know that 1 out of 3 cats prefers to nap with De Atramentis Raphael ink? With a hat tip to Lost Crates, the Noteslate looks like a really cool idea but I'm wondering if it works in real life? A favorite pen for many of us is the Zebra Sarasa Clip, a retractable gel ink pen with a push clip so you don't break the plastic when slipping it on your pocket or notepad. I love this idea, as I do tend to break this part of the pen. This new Sarasa Clip is the Eco, a green pen using 81% post consumer waste material. I do like this design quite a bit, with the black rubber grip, clear barrel, and the extra-wide clip giving a hit of color in white, blue, and green. For whatever reason I think it's an elegant and modern-looking pen. Like all the Sarasa pens this gel ink is a smooth-writing instrument. The 0.7mm tip is definitely wide, and doesn't lose any width when you angle the tip. 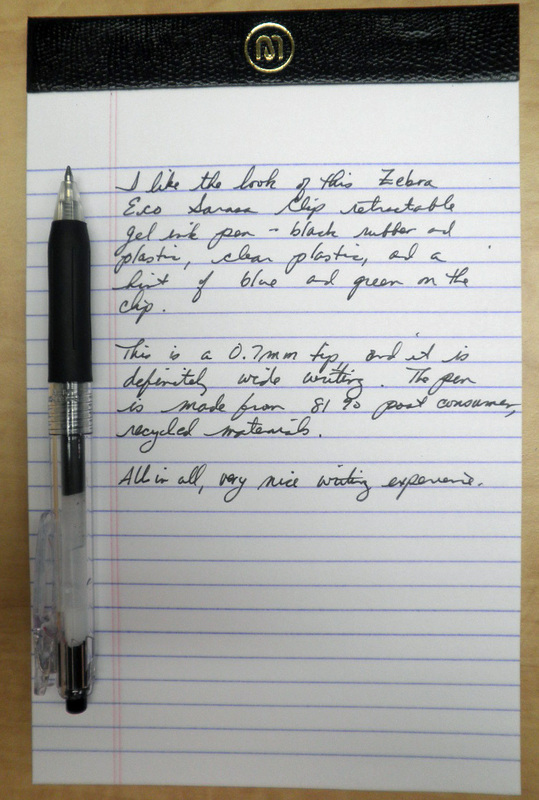 The ink works well on many papers, including a standard-grade notepad I had in my office. No bleed through but a shadow, so double-sided writing may not be available depending on how thin the paper is. But all in all this is a great pen, and a new favorite in the daily arsenal.